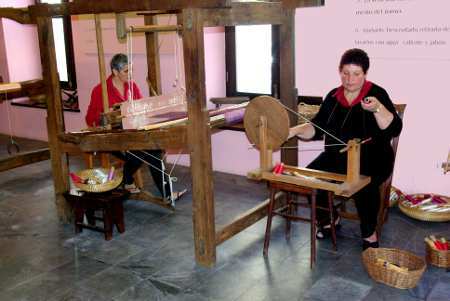 La Palma has a long history of silk production, going back to the 16th century. In fact, at one time, silk was made in all the Canary Islands, but since the 19th century, El Paso, in the centre of La Palma, is the only place which still produces it. They use an old fashioned, labour-intensive technique, the only place in Europe which still does so. You can see most of the process at the silk museum in El Paso, where the staff will talk you through the process in Spanish, English or German. The only parts they don’t do on the premises are those involving boiling water. First, you have to care for the silk worms. They eat mulberry leaves, but you can’t just leave them on the mulberry tree or the birds will eat them. You have to keep them in a box, and collect leaves for them, and clean the box out. 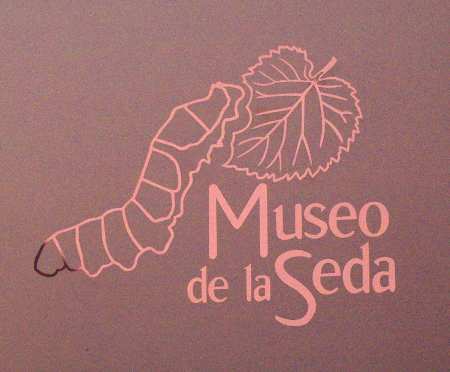 They have silk worms on view at the museum in the spring, but there are none available at this time of year. Eventually, of course, they make themselves cocoons. If you let the silk moths hatch naturally, they chew through the threads to get out, and you’re left with a bunch of short threads, instead of one long one. So they put the cocoons into boiling water, which softens the natural glue holding the cocoon together, and pull out the threads in groups of about 15. Amazingly, you get about 1 km of thread from each cocoon. Once the threads are out of the water, the glue hardens again, and the sticks the individual threads into one. At that point, it doesn’t feel like silk. It’s much rougher, something like linen. The threads are wound onto a drum, with thicker sections separated from thinner ones. From there, they’re wound onto bobbins, and then two or three threads are wound together onto another bobbin, to make a thicker thread. (The thickness of the thread depends on what it will be used for. Ties, for example, are generally made of three-ply silk.) These threads are then twisted together by hand, working one section at a time, from the bobbin at the right of the picture to the one at the left. 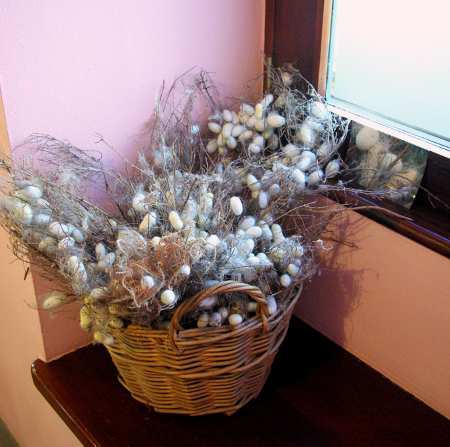 Then the silk is wound into skeins again, so that it can be boiled with soap, to remove the natural glue. This gives the silk gets its delightful, soft texture, and allows it to be dyed. 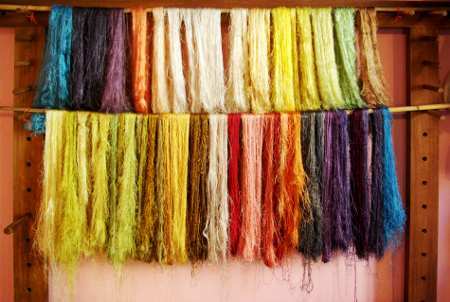 Plant dyes and the colours they give to silk. 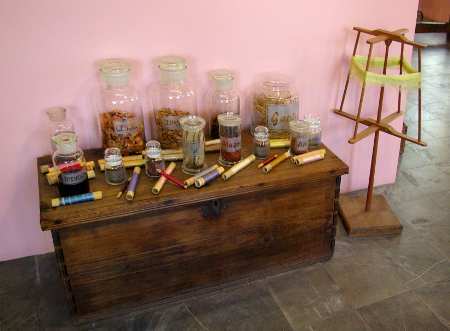 Only natural dyes are used. Most of them are plants, like eucalyptus leaves, marigold petals, almond shells and onion skins, but cochineal beetles and lichen (Roccella canariensis) are also used. The silk comes out with beautiful, glowing colours. And then it has to be wound onto bobbins yet again, and finally woven. The museum contains three looms, with the oldest dating from 1860. All this hard work makes the final product distinctly pricey. A tie costs about 150 € and a scarf costs about 210 €, and both are on sale in the shop, along with smaller, cheaper items. 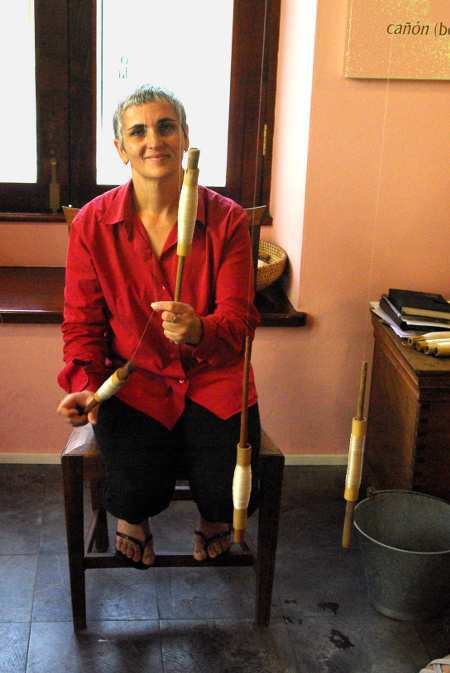 Opening hours: Monday – Friday, 10 a.m. – 1 p.m., also Tuesday and Thursday, 5 p.m. to 7 p.m.
Winding silk onto bobbins and weaving silk. I don’t make or sell soap, but I don’t mind trying to find the people who do, especially since it’s made such a difference to your daughter. Was it the olive oil soap, or the goats’ milk soap? Oh wait, is this soap you bought at the silk museum? I think they have one with silk in it.